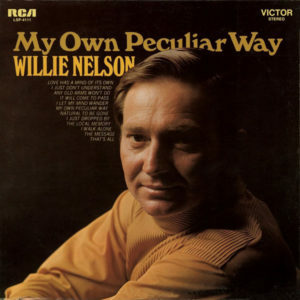 Of Willie’s numerous forays into hybrids of country and pop in the late 1960s and early 70s, My Own Peculiar Way is probably the most consistent. The backing arrangements are all reasonably suited to the music, unlike the jarring discontinuities of Willie Nelson & Family or the revolting and overbearing schlock of Laying My Burdens Down. That isn’t to say this is a great album. It is unambitious. But it is also pleasant enough. The Hungry Years — not to be confused with a budget-priced compilation album from the early 1980s by the same name — is one of the most obscure albums in Willie Nelson’s vast catalog. The original sessions were in 1976 at Studio in the Country, located in between Bogalusa and Varnado, Louisiana. There were overdubs in 1978, then the tapes were shelved. They were found in a deteriorated state in the late 1980s, restored, and then further overdubs were added in 1989 and 1991. Amidst Willie’s troubles with the IRS, he negotiated the release of The I.R.S. Tapes: Who’ll Buy My Memories?, of which a significant portion of the sales were committed to his tax debt (which was mostly accumulated interest and penalties, actually). The I.R.S. Tapes needed to go multi-platinum in order to cover the tax debt, which was overly optimistic. It was sold by mail via 1-800 telephone numbers, supported by TV ads. Starting around June of 1991, The Hungry Years was offered to callers as an add-on. It is not clear that The Hungry Years was ever advertised aside from being mentioned to people calling the 1-800 numbers seeking the I.R.S. Tapes album. But The Television Group, the Austin, Texas company running the telemarketing, went into bankruptcy, and by February of 1992 the 1-800 numbers were shut down. While The I.R.S. Tapes was eventually made available in regular stores, it does not appear that The Hungry Years was ever sold through conventional channels like brick-and-mortar music stores. So that means this album was only ever commercially available for less than a year, and even then only through an obscure call-in mail-order program. Some discographies neglect to even mention that it exists. The sound of the album falls somewhere between Sings Kristofferson and To Lefty From Willie. The songs draw from the likes of Neil Sedaka and Paul Anka. These were respected songwriters at the time, and even Elvis covered Anka’s “Solitaire” around this time. Their songs have not aged all that well, though, because they fit too comfortably into the mold of being laments of the white patriarch dealing with having to be an “individual” after second-wave feminism and the decline of trade unionism. Overall, there are also a few too many little curlicues and other ornate features added to the music here. It might be the overdub sessions — not one, not two, but three — spread out over 15 years that contribute to that, but Willie’s own contributions are partly to blame as well. His vocals are a little overwrought sometimes, with too much vibrato and too often forced into the upper register of his vocal range. Though even guest Emmylou Harris does the same on one song (“When I Stop Dreaming“). He does add some interesting guitar solos on Trigger. His sister Bobbie gets a good amount of time in the spotlight, which is nice. There are all sorts of good bits on this album. The biggest problem is that those good bits don’t ever come together in any unified and coherent way. They just float around among more dubious elements and arrangements that are a bit off. 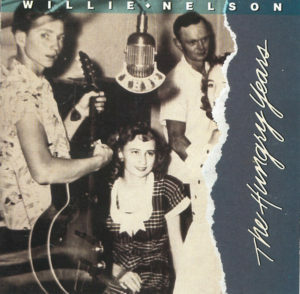 For instance, the 1989 overdubs add a horn section — one of the only times one of Willie’s albums tried to recreate the style of Shotgun Willie. But Shotgun Willie had horn arrangements in a classic soul style. These are merely passable approximations. The most sympathetic performance is probably the last song, “Carefree Moments.” But the song itself is not particularly well-written, and a good performance can’t remedy that problem. So this album always threatens to be really good, but seems to consistently fall short. This rare album is no lost classic. Yet considering the sorry state of so many of Willie’s albums from the 1980s and early 90s, this was certainly better by comparison. 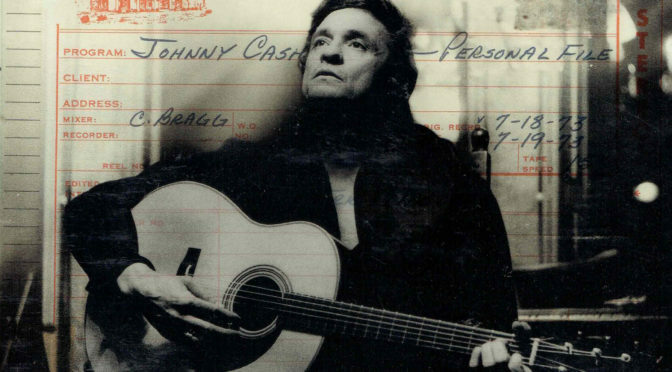 Ragged Old Flag was a transitional album in which Cash finished off with his folk-country phase that began with Hello, I’m Johnny Cash and started to establish a more contemporary sound with the help of producer Charlie Bragg. The Junkie and the Juicehead Minus Me finds the new style firmly established. It’s clearly influenced by the big country stars from Texas, like Kris Kristofferson, Willie Nelson and Waylon Jennings (those three would team up with Cash to form The Highwaymen a decade later). Kristofferson especially looms large, with two of his songs featured including the great title track. It makes this album a little grittier, looser and modern than typical Cash fare. A few other songs take on more of a bluegrass flavor. Funny thing, though, is that there are a number of songs here where vocals are handed over to guests–all part of Cash’s extended family. On these he sometimes delivers only one line (“Ole Slewfoot”), or nothing noticeable for the entire song. But that’s actually not such a bad thing. The album’s biggest weakness is the lackadaisical effort Cash puts into his vocals. Still, the album tries for a contemporary sound and achieves it without it coming across as forced, and it has aged sufficiently well. 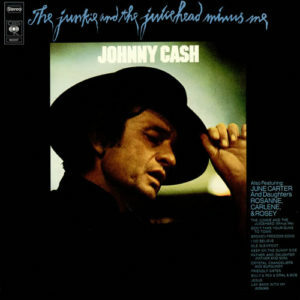 This is another of those 1970s Cash albums that’s fairly decent in an average sort of way, and no classic. His next few albums represented a step down in quality from this one. 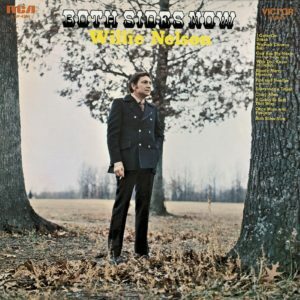 In the late 1960s and early 1970s Willie Nelson’s album displayed a clear interest in what was happening in rock/pop music. He had a few years of national touring under his belt, and had been exposed to the wider world somewhat. 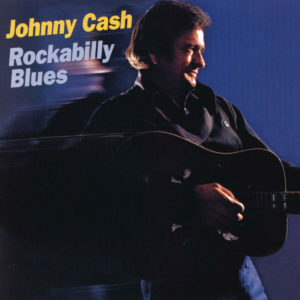 His records still adhered to the dictates of the Nashville system, but tried to combine Nashville country with pop/rock. The thing was, these were somewhat timid attempts. Willie latched on to only the most conservative pop of the day. He also still clung to an old-fashioned way of singing for the most part. It was as if he took a correspondence course on how to be a successful singer and he dutifully followed a list of instructions that included “Enunciate clearly.” In a way, he still sang like a louder, southern Bing Crosby or Frank Sinatra. After his Nashville home burned, and he and his band briefly relocated to Texas under communal conditions, he finally did summon the courage to try bolder things with his music. That eventually led him to Atlantic Records in New York, where he made a string of classic albums and achieved stardom. Laying My Burdens Down displays clear attempts to look beyond country music. 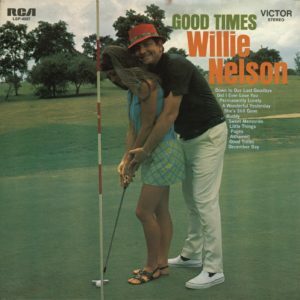 The results aren’t as awkward as on the following year’s Willie Nelson & Family, but they are cheesier. The backing vocals retain a little of the classic Nashville feel, though they make overt attempts to combine pentecostal gospel chorus and 5th Dimension-style pop affectations. The horn arrangements lean heavily on the style of Herb Alpert & The Tijuana Brass. Willie does play his acoustic guitar Trigger some, but also an overbearing electric guitar much of the time. In general, his guitar playing is aimless and confused. The guitar ranges from being overbearing to indistinctly cluttered. The strings are fine, if a little cheesy. 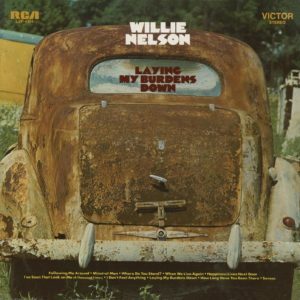 Willie’s vocals show signs of moving beyond the old crooning style, but only tentatively. It would be a few more years before his vocals settled into the style that helped make him a superstar. This album isn’t terrible. It still is a lesser Nelson effort. 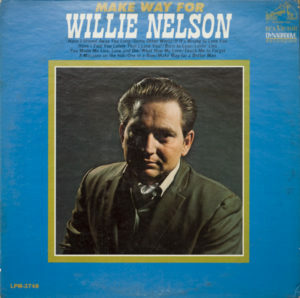 Some of the backing vocals and other orchestration was stripped away on a few songs for Naked Willie, released almost four decades later, which provides a somewhat contrasting perspective. 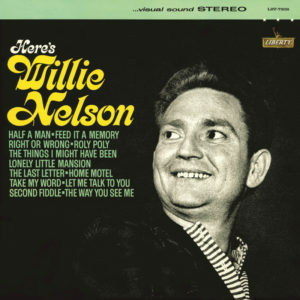 It is curious to think about how Willie’s interests in rock and the counterculture were problematic because he was a southern outsider, not able (if willing) to step into that milieu directly, but also having no one at his Nashville-based record label able (if willing) to help him connect with the predominantly northern rock music world. Willie was kind of stuck between two incompatible worlds — a bit like the film Electra Glide in Blue from a few years later. So this remains a transitional effort that pales in comparison to what hindsight shows was just around the corner. Yet this does retain some kitsch value.